You can use the Perfect Diet Tracker to track any nutritional profile. 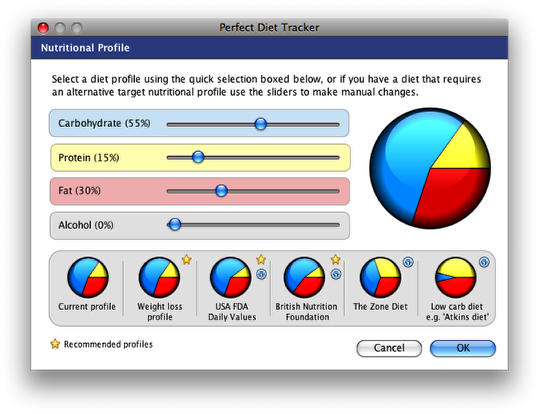 The software defaults to government recommended nutritional profiles however if you want to work with a different profile, for example ‘The Atkins Diet’ or ‘Zone Diet’ you can adjust the target profile to suit. From the file menu select ‘options’, then ‘change nutritional profile’, or alternatively click the small spanner icon shown in the picture above, located just to the right of the target nutritional profile pie chart. The nutritional profile window lets you select either a preset profile for a number of popular diets, or set your own targets. Simply drag the sliders to adjust your targets and the percentages and pie chart will automatically update to show your current selection. Alternatively click on a profile from the preset options. If you want to return to your current profile click on the ‘current profile’ pre set option. Once you are happy with your selected profile click ‘OK’ to save and use your new profile or ‘Cancel’ to quit without updating. A suggestion: given a nutritional profile and energy target it is possible to compute the protein/carb/fat breakdown. By adding the difference between the profile consumed and the target profile, it’s possible to know at a glance how much of each I have remaining. This makes it easy to select foods to match. For example if my target is 200g/100g/50g (protein/carb/fat), and I’ve consumed 75/120/30 so far, a ‘remaining’ profile would let me know how much of each macronutrient I have left. This would make it easier to select my next meals, if not on a plan. I’d put this just below the existing totals for the day. Thanks for the suggestion Steve. The issue would be a design rather than technical one as this should be easy to implement, but it is fitting it into the window layout for smaller screen devices that may be the problem. We will see what we can do, perhaps we can add this as an extra box in the diary if the screen size exceeds a minimum dimension so users with smaller screens get the current layout, and those that resize get an extra ‘remaining’ column. Leave it with us as we will work on it! Question: Is there a way to subtract the fiber grams from the carb grams? I do this by hand now, but having it done automatically would be more convenient. Love your program and the fact that you keep refining it. We are afraid this is not possible at the moment, but we will add it to the ‘wish list’ and see if we can get it in there sooner rather than later. Thanks for the suggestion. It would be nice to be able to specify personal targets in addition to the built in ones. For example, so many liters of water, or so many grams of fiber. Another desirable option would be to be able to review performance over various timeframes. For example, over the past month, quarter, or year. We agree and will see what we can do!